Bookshop Santa Cruz Cinema Ad – Michael King. 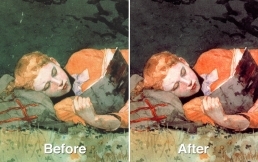 The original scan of this Winslow Homer image had a strong green color cast and other problems that needed to be fixed. I performed the color correction and touch-up work in Photoshop to remedy this and restore it to its original appearance.